If you can even look at a bicycle seat in the weeks following childbirth, well done to you and your miraculous perineum. For a couple of months I just pretended that I had never ridden a bicycle and it made me feel all the more comfortable with my fragile bundle of joy and my even more fragile bottom. But this feeling doesn’t last and after a few months I went for a couple of solo rides for some fresh air and all the other good things that go along with being on a bicycle. Then I started contemplating how I was going to bring my baby along for the ride. My researched started by just observing the brave men and women who had a small child somehow attached to their bicycle. I became fixated on the idea of having my baby in front of me. With him between my arms it somehow seemed like it would be the safest and cosiest way to go. I figured I’d still be able to put panniers on my back rack and this would allow me to even do the shopping by bicycle. I started to admire the people with such a set up and planned my comeback. I excitedly walked my bicycle to the local bikeshop (because I didn’t want to ride with Dante in the carrier) and asked for them to fit my bike with an attachment for a yepp mini. They looked at my touring bike and told me it might be tricky but said they would give it a go. To cut a long story short, after about five visits to the bike shop, I finally brought home the seat and put it on my bike. I soon realised I couldn’t straddle the bike because the distance between my seat and the baby seat was too small. I would either be having to dismount my bike every time we stopped or put my seat down so low I could straddle my bike while seated. Or I just wouldn’t use that bike seat and it would sit in our garage for three years gathering dust. I went for this option because I didn’t like the idea of compromising my stability and confidence in my ability to ride safely while I had a baby on board. I’m sure that other bikes and bike riders can make this configuration work but I couldn’t. Meanwhile, I started carrying my baby on my bike on my back in the carrier (mainly because I got sick of walking my bike to the bike shop). He really liked it and I would try and I really liked that because he was attached to me, I didn’t have to worry about him falling when we were stationary. It was also great for him to sleep and give me cuddles. Hills were alright because he was still quite light and in general I felt quite confident. It isn’t legal in Australia to do this though and I did worry a bit about how safe he would be in a crash, but no more than some of the other ways of attaching a baby to a bike. I did come across a carrier with a shell type structure that might help get around my safety concerns. I remember at university a friend of mine asking me if I would ever put a baby in a bike seat on the back of my bicycle. At the time I said no because I couldn’t actually ride a bicycle myself. I claimed it was because it was too unsafe, but I was just saying whatever I could so I wouldn’t have to admit that I couldn’t ride a bicycle to a guy I liked. Fifteen years later, I was working out the safest bike seat to prove my younger, less informed self wrong. I opted for the Hamax caress because it looked solid, had suspension to stop my baby getting shaken, and you could even tilt it back for when my baby started to doze off. I also met a couple with one and they seemed to be cool and well-informed. I bought it online to avoid the dreaded trips to the bike shop and assembled it quite easily. The only problem was the distance between my saddle and the baby seat was almost non-existent so the ability to tilt it backwards became a non-feature for me. I had every intention to try first with a sack of potatoes to avoid my first wobbly revolutions involving a baby’s life. However, I didn’t have any potatoes the day the bike seat came but I did have a baby. He survived as I slowly adjusted to his weight load sitting up high on the bike. With momentum on the flats I barely noticed and my previous experiences dinking probably helped. However, going up hills or coming up onto the pedals (off the seat) for any reason were a bit of a shock. It also shocked my baby and he had a good grumble everytime the bike rocked with my swaying effort. I resigned to stay seated on the uphills and just let my gears and my solid grip keep me balanced and get me up the hills. Stopping and starting were also a trick, working out how I could lean it against a wall or how I could somehow balance it on me. I had a kickstand but I couldn’t trust it completely once the weight of my son was on the bike. 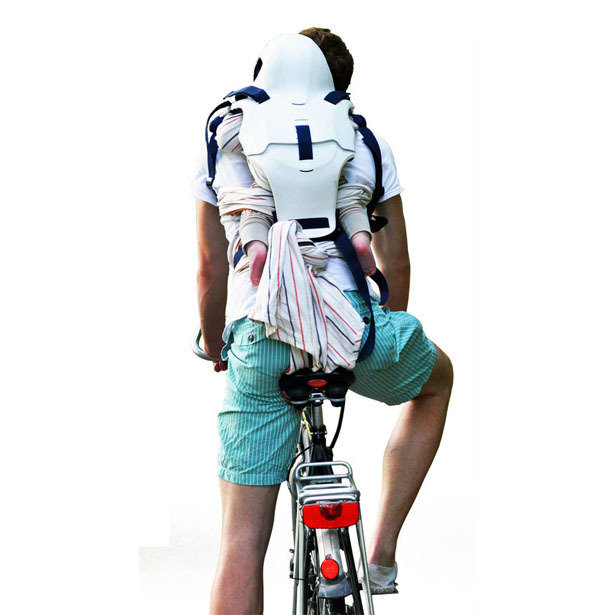 I’m not sure what the best tricks are, but I just found a way to make sure the bike would be leaning on me and I would be able to stop any potential fall. Sleeping was an issue though as the initial gleeful giggles turned into sleepy grumbles, he would startle himself awake as he couldn’t lean back properly. If the reclining function had worked it may have been a different story but I ended up more than once putting him into the carrier towards the end of the ride. Then there was the problem of panniers. Ever since I discovered panniers, I was emphatic in my dedication to these spacious bags you could clip onto your bike. I had shopped, toured and even moved house with the help of these wonderous sachels. But now, there was no space on my rack for my beloved panniers. Initially I resorted to clipping a small bag onto the back of the bike seat in a very unconventional manner. It sometimes worked but it was very clumsy and limited. Eventually I bought a front rack and some smaller bright yellow panniers to go with it. It worked well and I could pretend to be touring if I didn’t look behind and notice a small person there. I kept riding with this set up (including riding up our hill) until a few days before my second baby was born. By the end, even with a big belly, I was feeling stronger and longing to keep this configuration. I could carry my toddler wherever we needed to go, and even put the bike on the train to go further. Alas, I went into labour early and my days of riding with one attachment were virtually gone. I spent many hours staring at online bicycle catalogues, between trailers, cargo bikes and everything in between. Should it fold up, convert into a pram, have three wheels, or two, handle well, be able to fit onto a train, be heavy or light, carry lots or just enough, be good for the rain, the wind, hills, siestas? I probably over thought the prospects of how I would carry two kids on a bicycle. In the end I went with a Thule chariot and while I searched for a secondhand one I ended up buying it new. I figured it wouldn’t hurt to have once extra bike trailer in the world. So far, I have enjoyed pulling my two children. Momentum is amazing – when you first start off you feel like there are a couple of logs dragging behind you, but then you forget there is anything at all and sometimes it even gives you a kick along when you go slightly down hill. While we are moving swiftly the kids tend to be happy, but they hate stopping and starting and the problem with two kids together in a confined space is they have to cope with each other. Well, sometimes they entertain each other which is fun to hear. Uphills is a slog but the stability of the extra wheels on the trailer mean I’m not trying to pedal and virtually trackstand at the same time. By the time I’m home they are usually both asleep and I can’t believe how angelic they look. 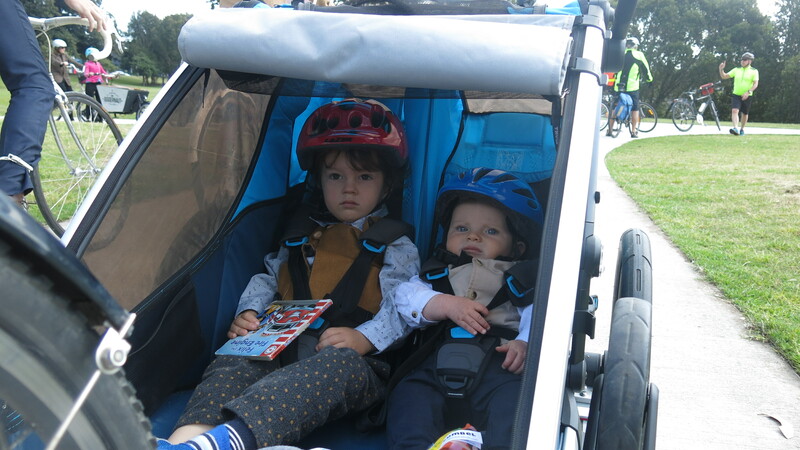 I can get out of my seat and I can use the panniers which is great (I prefer to keep the trailer for the kids and light things and use the panniers for anything heavier). Getting in and out is not as easy as I first thought with my bike falling over as a jiggle the kids into the trailer. I have learnt to lean it agains a wall or something solid. As for converting it into a pram, it’s possible but sometimes I’m flighting with the bits to make it work. I’m sure there are more pros and cons to this and all the other bike configurations I’ve tried. I’m keen to hear about yours so please comment (I am trying to put together a more general list of configurations for bikes with babies and may put together a survey but in the meantime check out https://thismombikes.net).